On December 22, 1922, Grand Duchess Charlotte of Luxembourg gave birth to a daughter, Princess Elisabeth. It was decided that this happy occasion should be celebrated by a special stamp issue. The printing firm of Joh. 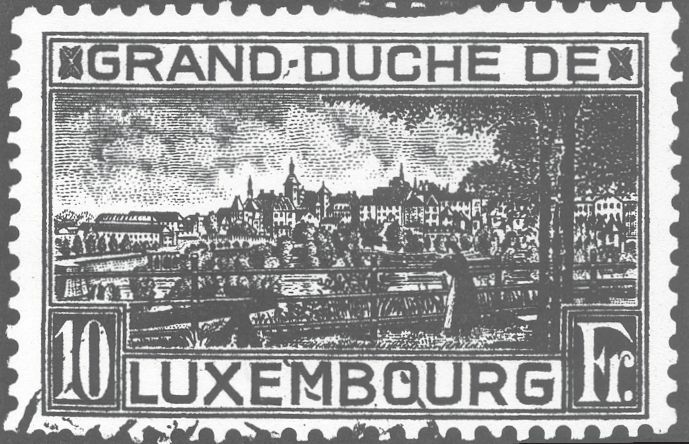 Enschede in Haarlem, the Netherlands, was already preparing a stamp for regular issue, a 10 franc black showing the city of Luxembourg. The fi rm was ordered to print a small number of these 10 franc stamps in green on a 78 x 59 milimeter sheet of paper. This was the world’s first souvenir sheet. Earlier some stamps had been printed in sheetlets of fi ve or ten stamps, but this one was intended to commemorate a special event. In the margins it was to have a punch~out in the shape of a crown. The souvenir sheet (Scott number 151) was issued on January 3, 1923. It sold out almost immediately and a second printing was ordered. It went on sale January 15. The perforations on the first printing framed the design. On the second printing the perforations extended from the corners. A total of 5,100 souvenir sheets were printed. 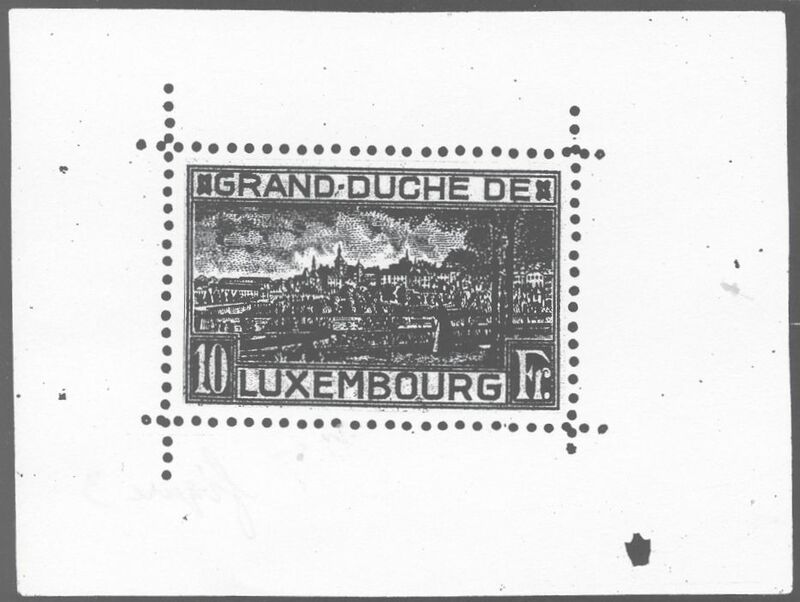 Two months later the regular issue 10 franc black, printed in sheets of 50, was issued (Scott number 152) and remained on sale for 12 years, until another printing had to be made in 1934. In the meantime the souvenir sheet enjoyed great popularity and quickly increased in value. Then, here came the forger. He produced a well-executed item, but there are many differences in the design. The most noticeable difference is in the cloud formations. Also the inner frameline around the vignette is missing. 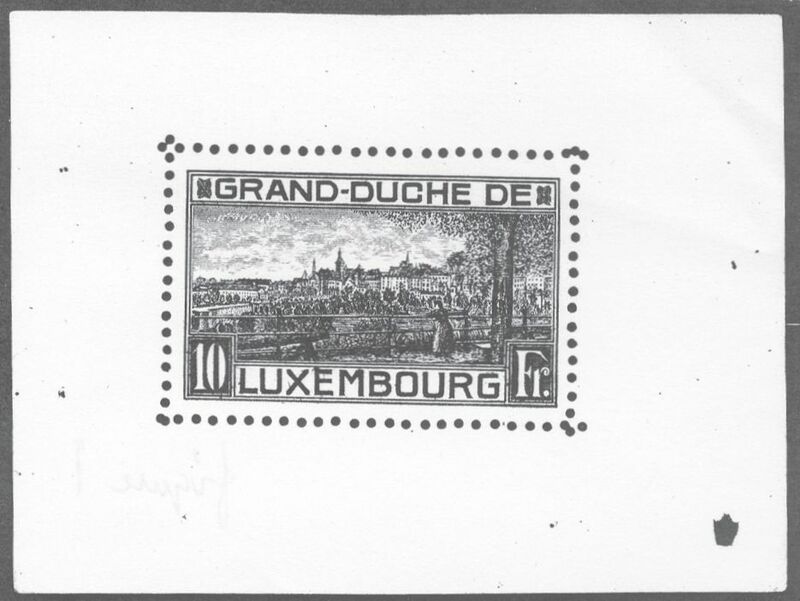 The right arm of the “un in “LUXEMBOURG” is slightly to the right of the vertical post in the railing in the genuine, while exactly in line in the forgery. Careful study reveals other subtle diffferences betwen the genuine stamp and the forgery. 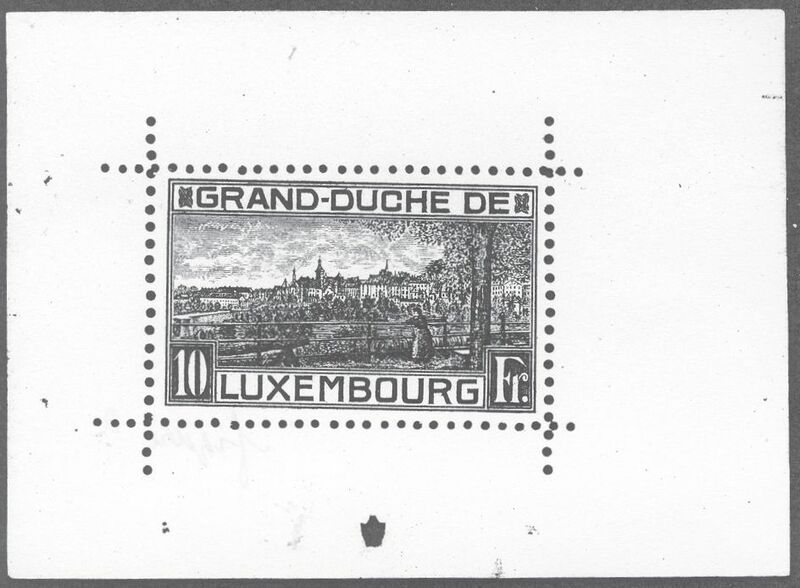 Since the 10 franc black was a common stamp, readily available, and identical in design, it was easy to ascertain if any souvenir sheet was genuine or a forgery. But the forger had a solution for this. Since he still had his die, he now started printing a large quantity of the 10 franc black. He flooded the market with them, thereby causing great confusion among collectors, who for a while did not know which was which. 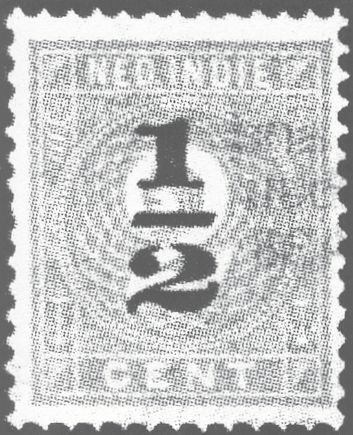 In 1902 the postal service of the Netherlands Indies needed an additional value of a half-cent stamp. The two cent brown, issued in 1884 (Scott number 18) was still in large supply. Two and a half million of these stamps were overprinted with “1/2". Both the half-cent stamp and the two cent stamp (Scott number 18) are common and of little value. A few years before World War II, while I was still in the Netherlands, this half-cent stamp surfaced with an inverted overprint. It was found in a packet of 100 different Netherlands Indies stamps. The inverted overprint was an unknown variety and caused great excitement. Everybody started looking for it. Sure enough another one was found. Also in a packet. However both turned out to be forgeries. Why would anyone forge a stamp that did not exist? The packets that contained the inverted overprints were traced back to the original supplier. He turned out to ~ part-time packet maker. He owned a printing shop and made packets only as a sideline. When questioned he stated that at one time he was one stamp short of completing 100 different, so he took the two cent stamps, of which he had plenty, and overprinted them to complete his packets. He had not been aware that he had printed some of them upside down. Most intriguingly, those stamps he overprinted correctly are still around. Therefore, forgeries exist of a stamp that, when genuine, is worth only a nickel.